Today we're announcing Evernote for Mac, version 6.11.1 GA. You can download it here. This release addresses issues some users were encountering with the note editor in version 6.11. Thanks to the Beta community's support in helping providing feedback on this dot release. As always please let us know if you have any feedback or spot any issues with this release. Today we're announcing Evernote for Mac, version 6.11.1 GA.
Great! I look forward to it. Thanks again for all the quick responses and hard work from the entire team. The Paste works perfectly in Ver 6.9.2. This version going back my notes in tables. I only upated the app (from Mac App Store) and work so fine... again! The issue was at least acknowledged (by Johnathan, IIRC) once, but has never been fixed. Guess I'll have to stay with 6.9.2, again, since it's not even mentioned in the release notes. Sad! Thanks for mentioning this. Can you provide an ENEX file where simplify formatting removes returns, or point me to another thread where you provided one? Also, can you clarify what you expect to happen when you choose "simplify formatting"? It is supposed to adjust the underlying HTML of the note in such a way that it makes it more predictable and well-behaved while editing. For some complex notes, it is difficult to simplify it in such a way that accomplishes both (1) the exact same rendered look and feel of the note and (2) a predictable and well-behaved editing experience. For example, if you copy the entire yahoo homepage or the ny times homepage and paste it into a note, it will have a quirky editing experience because of the heavy complexity of the underlying HTML. However, if you simplify it, it will be more well-behaved, but the look and feel of the note will have changed. In other words, are you expecting "simplify formatting" to have no effect at all on the way the note renders? Could you please provide an example, with URL, of this so I can test. Apologies to Johnathan though, for it's Jason who responded, not Johnathan. I've just set up a public notebook (first time doing this, hope it works as expected) with examples, for anyone who wants to take a look. Please read my description in the post quoted above if you can't see anything wrong. 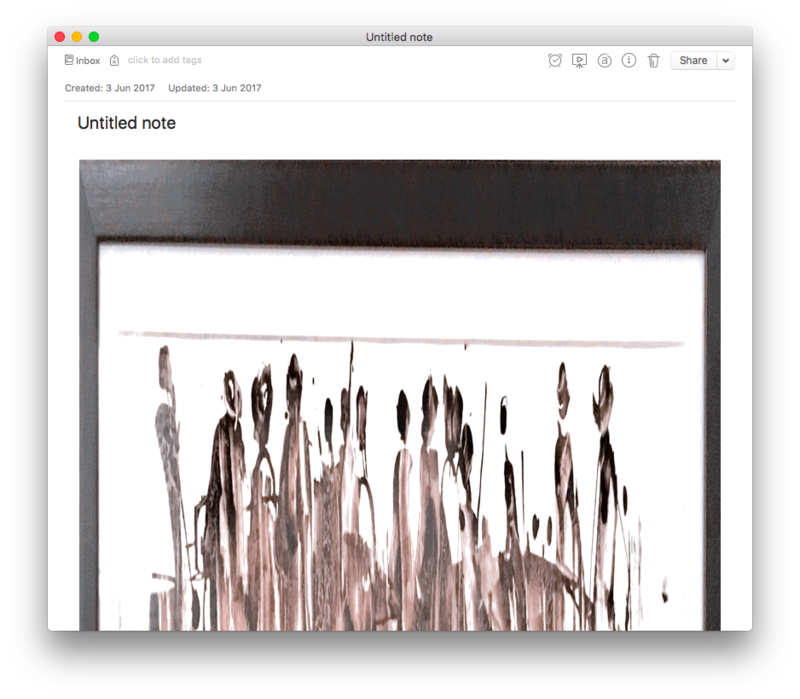 Running Evernote 6.11.1 on macOS 10.11.6. This is a very strange result that I have never seen before. (same web page used by @mwang above). If I delete the first image BEFORE I simply format, then it works well. ENEX files before and after are attached. Again, same behavior on both EN Mac 6.9.2 and 6.11.1, but ENEX are from 6.9.2. I can report that v6.11.1 has NOT RESOLVED ONE OF THE MANY ISSUES (I've lost count but let's say its around 10) that I have raised with Evernote over the last few months and which has been the subject of an inordinate amount of correspondence and effort. Furthermore, in a cruel twist of fate, the very note that I set up to manage the myriad of issues that I have raised can now be used to consistently hang the entire Evernote application through nothing more than a simple de-indent associated with a numbered list. Here's a screen shot showing the pitiful status of the issues that I have raised. Evernote should be utterly embarrassed that this is the best they can do after 10+ years of software development. Would it be possible for you to copy/paste this list as text, so we can respond to each issue individually? Also, for those that you state "does not resolve any of the issues in this video", could you please list the actual issues. I'm sure Evernote will need to know the details to resolve the issue, and it is always best to make it as easy as possible for them (and us) to understand the issue. My fault; I should have mentioned it. No, other things beside the first image are not removed; they are just obscured by the first image, which is indeed "stretched disproportionately" to cover the whole page. Remove the first image, and you'll see, uhh, the 2nd image, also stretched disproportionately to cover the whole page, and so on. The text would be revealed once you remove all the images. The screenshots I gave in the earlier post mentioned above, and the examples in the public folder I set up yesterday, have all gone through the same "pre-processing" in order to show what is wrong with the newest betas. The "stretched images covering the whole page" issue is unique to Guardian, and has been there since as far back as I can remember. I blame Guardian for it, and I've set up a Keyboard Maestro shortcut to make dealing with them easier. The "paragraphs being crammed together without separating lines" issue, on the other hand, is new, starting from 6.10 betas. And it's the one that force me to stay with 6.9.2. It's partially fixed in a later beta, so simplifying a page clipped from the New York Times website, for example, is no longer a problem. The problem nevertheless persists with all pages clipped from the Guardian. Appreciate the offer for assistance with the issues but the purpose of the post was simply to make it clear that the recent update has done nothing to assist with the myriad of issues that I have identified. These have already been raised, verified by Evernote Support, assigned ticket numbers and, I am told, are being addressed by the Evernote dev team. The problem is that after months of fiffaffing around with these they still are not fixed. 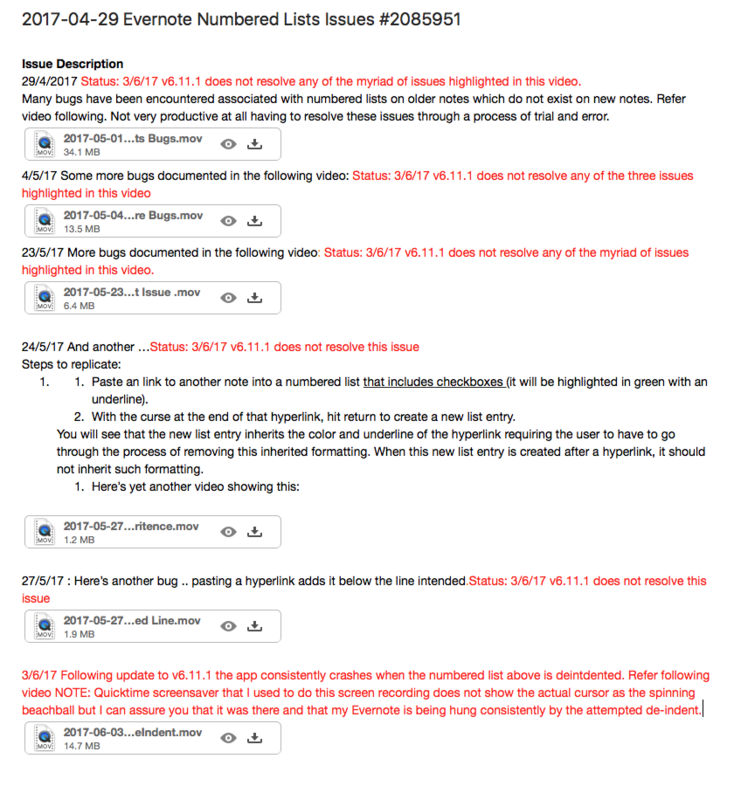 Many of these have also been raised by others in the forums so I don't think providing the details again is going to help solve them (in fact there is so much repetition on these forums of the same issues I doubt that Evernote even bother reading the forum posts anymore - I certainly know from my experience they don't). These are clear software development issues that only developers can fix. It just requires that Evernote management make it their priority instead of what I can only assume is misdirection in getting them to keep messing around with the UI and migrating to Google cloud platforms so that the CEO can help his buddies back at Google. ... in the meantime I'll keep waiting for all these alleged wonderful new features the recent refactoring is meant to produce but hoping that they really just get a basic note editor working like it should have been at least 5 years ago (you know something is awry when a 10+ yr old software company in the business of note taking gets excited about an update that provides working tables! .. now we just need them to get numbered lists working and we can have a real party). Since they are issues you have raised, you can choose whether or not to be as helpful as possible. Regardless of how many times previously posted, or raised by others, if you make it easy, in THIS thread, for the devs to see the details, by either re-posting, or better, by providing a link to the original post that has full details, then you increase the likelihood of Evernote taking action. You also increase the likelihood of users like me also testing and confirming the issue. I don't have time to search the forum for your posts to find the issues. So, until/if you post a link here, I will ignore your issues. Maybe your issues have not been fixed (who knows? ), but many other issues have been fixed, and the Evernote team has responded in an excellent manner to our posts about issues/bugs in EN Mac 6.11. I'm still testing, but so far 6.11.1 looks like it has fixed all material bugs that affect my workflow. Oh geez, here we go again. Another Guru thinking that he owns the forum. Please Indy, read my reply to you again. I don't want your help. I didn't ask for your help. I don't need your help. You can't help - you are not an Evernote developer. I know that hurts but this is not about you. What is the point on asking for verification from you of issues that Evernote themselves have already verified!? You will see that my post was in reply to Chantal's request for feedback which I provided in the spirit of helping Evernote see a perspective from a typical Evernote user which you are most certainly not. I doubt that any Guru who lives their lives on the Evernote forums is going to provide an impartial user perspective. I am truly happy that you are happy with Evernote but I can assure you that I am not, as many others are not - HINT: There is a reason that the iOS app hasn't climbed above 2 stars since v8 was released. I don't want your help. I didn't ask for your help. I don't need your help. You can't help - you are not an Evernote developer. To be blunt, I was not just trying to help you, I was trying to help all of us. If there are issues with EN Mac 6.11.1, then we all need to know about them, and, I think, want them to be fixed. If you don't want to be helpful, that's up to you. And you can definitely have the last word, because I'm done here. Have a nice day. 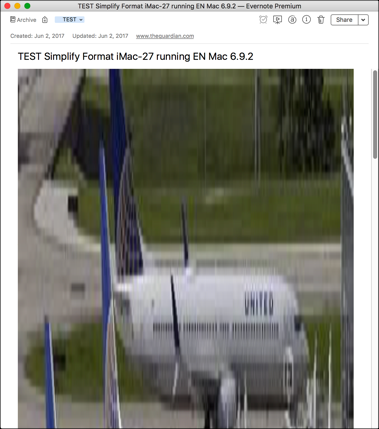 I am getting images like this now on my Mac version since updating for all entries that were "shared" from my iOS device to Evernote. I have a few THOUSAND notes that this affected, PLEASE tell me there is a fix for this? I am systematically moving all my DayOne App entries to Evernote little at a time (have 7,000+ entries over there) so all my data is in one area, but now all the entries have corrupted photos like this? My text seems fine, it's just the photos that are completely distorted. I'm seeing stretched images where I haven't simplified formatting. I actually noticed this in 6.11.1 beta 2 but I haven't been able to reproduce it consistently. I'm finding it happens most of the time with images scanned using the EN iOS app, but not always. I'm also seeing it with many imported JPEGs and PNGs. I'm also seeing it with many imported JPEGs and PNGs. Can you please attach one of these images that consistently does not display properly after import to EN Mac 6.11.1? Thanks for posting your images. I saved both images to a file, and then imported each into separate Notes in EN Mac 6.11.1. Both images displayed fine. Maybe the issue is how EN iOS is capturing/storing the images. It could be an EN iOS issue, but my first post in this thread was about images that I'd imported directly into EN Mac 6.10, so it seems unlikely to me. Interestingly, if I cut a stretched image from a note in the Mac client and then paste it back in (even into the same note), it displays fine. Not sure how to interpret that, but it caught my attention. Sorry to hear about your troubles. Important: For now, do not make any changes to the problem notes in EN Mac. It is most likely just a display problem which can be fixed with the next EN Mac update. If you make a change now in EN Mac Note, it may cause the distortion to be permanent. Both images displayed properly in both EN iOS 7 and EN Mac 6.11.1 (after sync). So, just guessing, the way images are stored has been changed in EN iOS 8, but the corresponding change for proper display has NOT been changed in EN Mac 6.11.1. 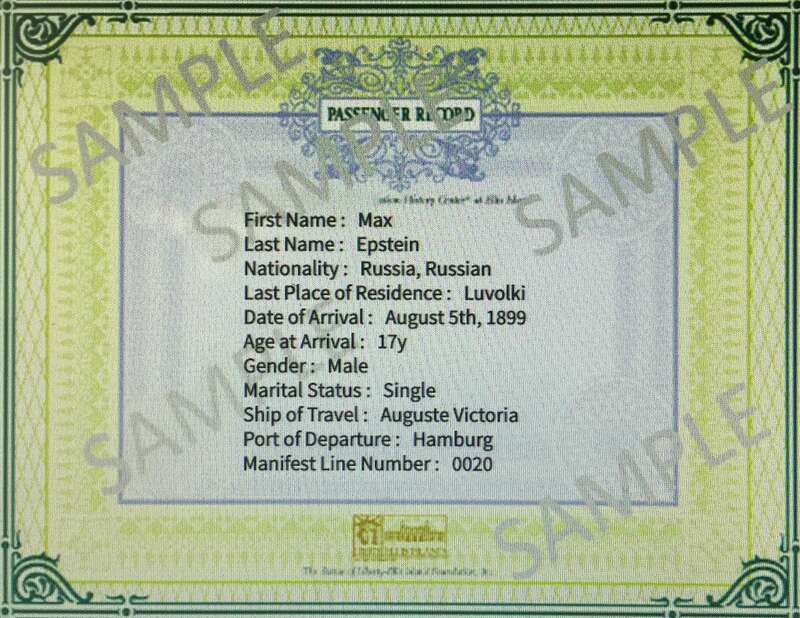 @Scott Fillmer, I'd suggest that you post an ENEX file here of one of the Notes with a distorted image. This should help the Evernote Devs resolve the issue. I can confirm this behavior in Evernote 6.11.1 on macOS 10.11.6. I agree, after have set the font and style for the entire table, the font and style should be retained when adding or inserting a row or column. If you zip the ENEX you should be able to get it under 2MB, unless you have many images in the Note. It would be best to use a Note with only one image, and then also attach the image separately. Wow! That is surprising. Maybe it is because you are a new forum member . . . If you have a DropBox or other online account, maybe you could upload the ENEX there, and post a link here. 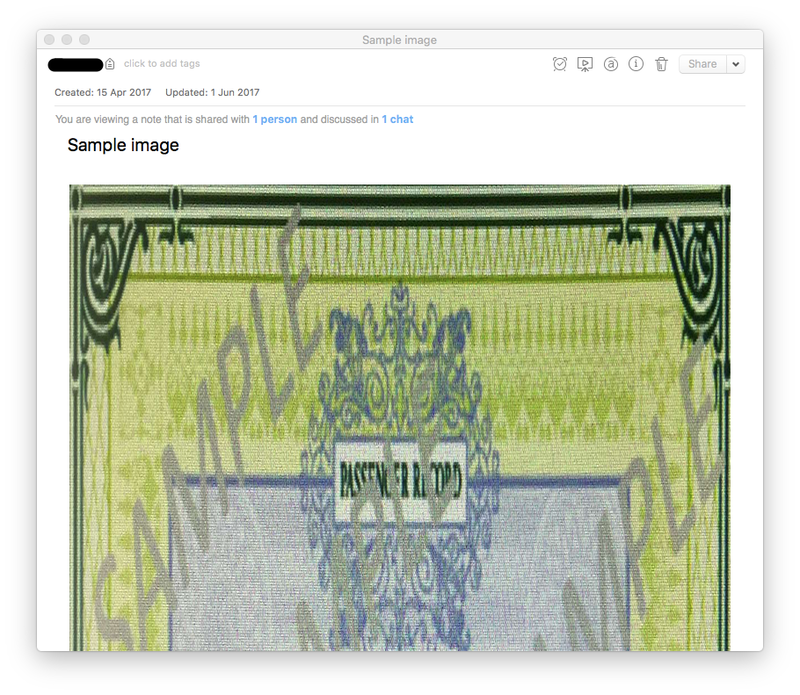 Evernote any update on this issue with the images? I've got a few thousand notes hanging in the balance, would love to know if there is something we can do on our end or if a fix is on the way? @JMichaelTX thanks for the suggestion about dropbox that I can do. Hey @DTLow, how's 6.11.1 working out for you? Any issues? Prior bugs fixed? I'm having no problems with this version. I have noticed with cut/paste between formats I almost always get some distortion. Still having problems with the images being distorted when sent from iOS device then viewed on Mac OSX version. Images look fine when viewed on iOS or web app, but really bad on Mac OSX 6.11.1 version? since it shows correctly in all devices except the Mac OSX version it looks fine when you click on the link and view it via web. Also, I've messed around with a few test notes that were "shared to EN from iOS" and some of them when you mess with the note a while suddenly has the image render in the correct proportions, but I can't figure out what causes it to revert to normal. It seems on the notes with distorted images within Mac OSX version that if you make any edit at all, even just a space at the end of the note, the pic just corrects itself to the proper dimensions. Of course I can't go do that to 6,000 notes but that's what I've found through trial and error. Just FYI. Where do I send a question about web clipper and my devices? 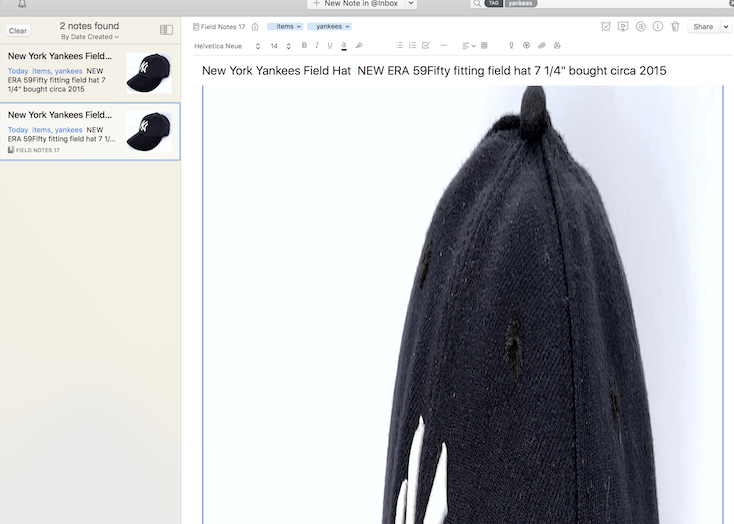 The items I web clipped don't appear on my iPhone, iMac, MacBook Air in the Evernote app. All that appears is what is on my iMac and HP that I enter from those two devices. I can sign in to Evernote in the cloud from my iMac to see what I have clipped, but my iPhone won't let me see that same cloud information. How do I get the cloud and what's on my devices to sync? It all boils down to the last question. Thanks for solving this little problem. Where do I send a question about web clipper and my devices? >>How do I get the cloud and what's on my devices to sync? Indenting (tab) checkboxes inside a table cell doesn't work - in fact nothing seems to happen. Update: there's a horrible keyboard shortcut (shift+cmd+] which is even worse than the standard Mac OS shortcut) or you can use the format text menu. Then how are we supposed to indent (text, lists) in a table cell? Yup I was tabbing. It's a pretty horrible shortcut but once you know it's there.....not particularly intuitive for new users. Sorry about that, Dev is working on some performance problems, if you have a sample note where this problem is most obvious you can share with Support and we can include it in our testing. Actually I thought I had solved the problem (a note that was too long). But actually it is not the problem. Evernote is definitely unstable and get stucked very easily. Closing the app and reopening does not really solve the pb. Restarting the mac solve the problem but for a limited period of time..